Note: this document applies to version 6.68.138 and up of Team Password Manager. If your version of Team Password Manager is lower than this one, please check this document: LDAP Authentication (before 6.68.138). Beginning in version 2.11.24, Team Password Manager allows users to authenticate against a Lightweight Directory Access Protocol (LDAP) directory or an Active Directory (AD) (Windows). This is useful for organizations that have an existing directory with usernames and passwords, and want Team Password Manager users to be able to authenticate against it. A user of type LDAP is created by an admin user. This user has the same properties of normal user but instead of a password, she has an LDAP/AD server and a DN (Distinguished Name), which uniquely identifies her in the LDAP server. The user's username is checked against the Team Password Manager database. If the previous step is ok, a connection is established with the LDAP server using the user's credentials (DN and password) to authenticate the user against the LDAP server. Security (1): Team Password Manager stores critical data. Any user that has access to it should be previously registered by an admin user to prevent unauthorized access. Security (2): since the user has her DN stored and enters her LDAP password at sign in time, no LDAP passwords have to be stored in Team Password Manager. Flexibility: Team Password Manager allows you to have LDAP and "normal" users. Also, you can turn an LDAP user to a "normal" one and viceversa. 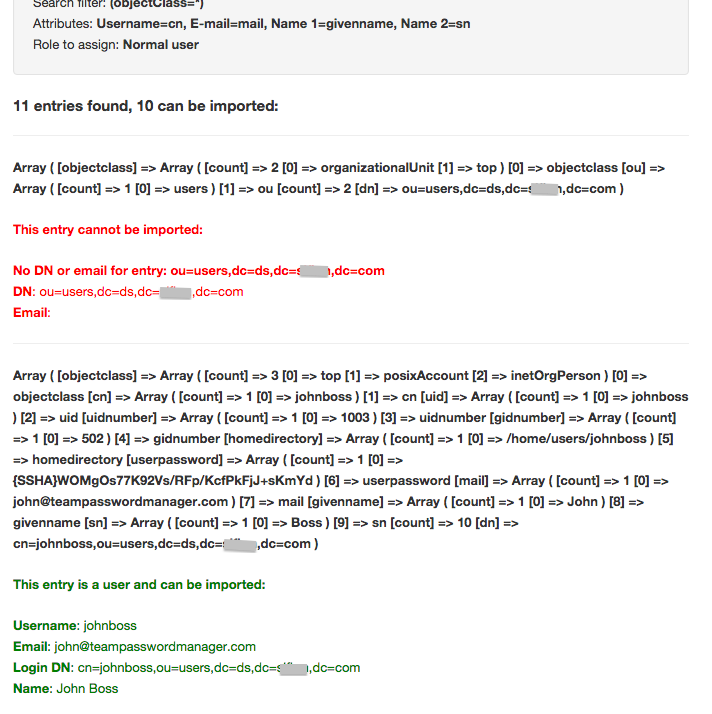 User homogeneity: an LDAP user in Team Password Manager has the same properties of a "normal" user. The fact that she authenticates against an LDAP server doesn't mean she has to be restricted in some way. Different base DNs: each LDAP user has her own DN, which might come from different branches of the LDAP tree. Team Password Manager includes an import mechanism to automatically import and create LDAP users so that you don't have to manually create them. Another important thing to note is that Team Password Manager will never modify any data inside your LDAP server. The only operations that Team Password Manager executes with your LDAP server are: bind/unbind and search. Setting up LDAP authentication in Team Password Manager involves: 1) setting up one or more server connections and testing them, and 2) creating LDAP users or converting existing users to LDAP. Read on to learn how to do this. Server DNS name or IP address. Example: directory.mycompany.com. LDAP port. The port that your server uses. If you don't enter any value, the default ports for LDAP will be used: 389 for non-SSL and TLS connections and 636 for SSL. Type of encryption. 3 values are possible here: "No SSL Connectivity", "Use SSL" (will prepend "ldaps://" to the server address and use port 636), and "Use TLS". LDAP protocol version. you can use version 3 (default), or version 2. Note that these are not backup servers, but different servers to authenticate users against. Each LDAP user created in Team Password Manager will use one of these three servers (you will set this in the user screen). 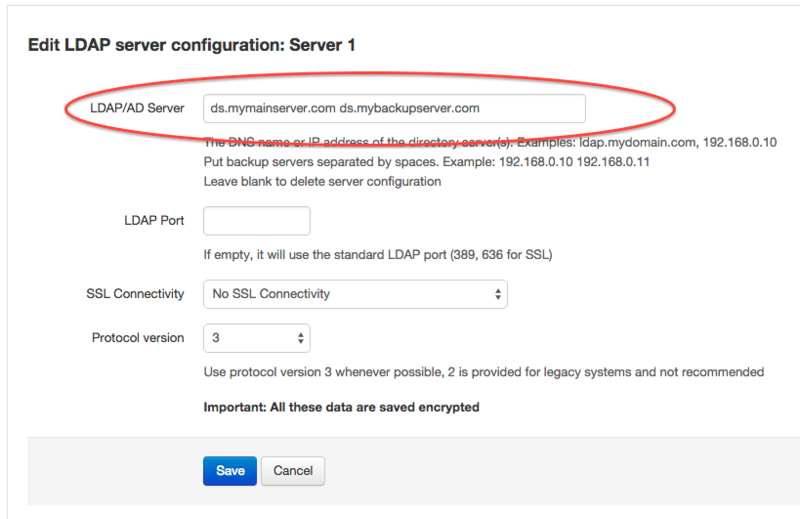 To learn how to use backup LDAP servers go to the Backup LDAP servers section in this document. Note: if you're using LDAP and you've upgraded from a previous version that didn't use multiple LDAP servers (versions lower than 6.68.138), your sytem will automatically use "Server 1" and you will not have to configure anything else. At this screen you can enter the login DN or username and password for a user that has access to the LDAP server, or you can click on the "Anonymous" checkbox if your server supports it. By clicking on "Test authentication", Team Password Manager will try to authenticate with your LDAP server to see if the connection works. The data you enter in this test screen is never saved anywhere, it's only sent to the LDAP server. Any LDAP users will not be able to sign in into Team Password Manager. If you want them to be able to do so, you'll have to convert them to "normal" users. LDAP users that are logged in will NOT be kicked out. You won't be able to create or import LDAP users. 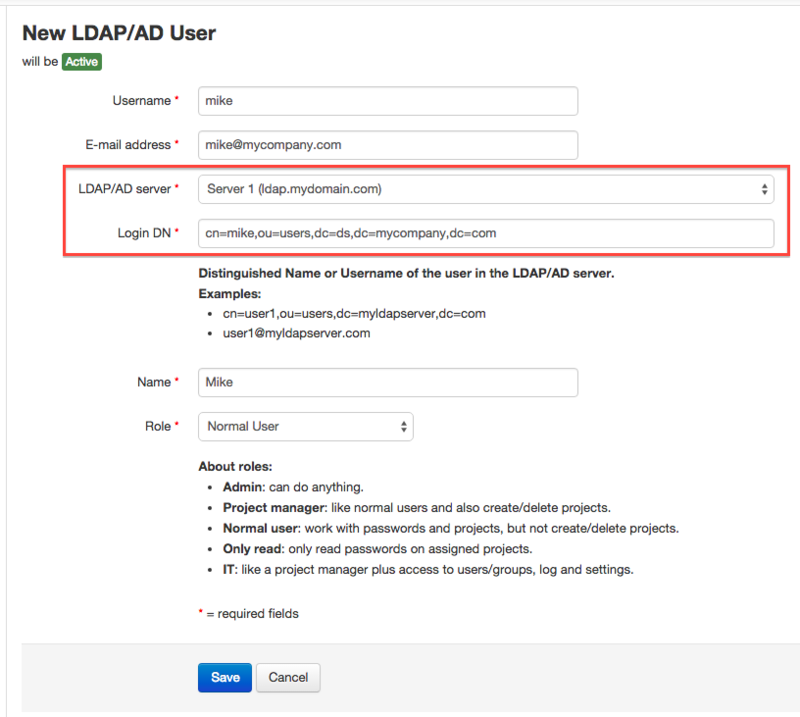 After successfully entering and testing your LDAP server connection(s) you can proceed to create LDAP users. You can do this in two ways: manually or automatically (importing them). 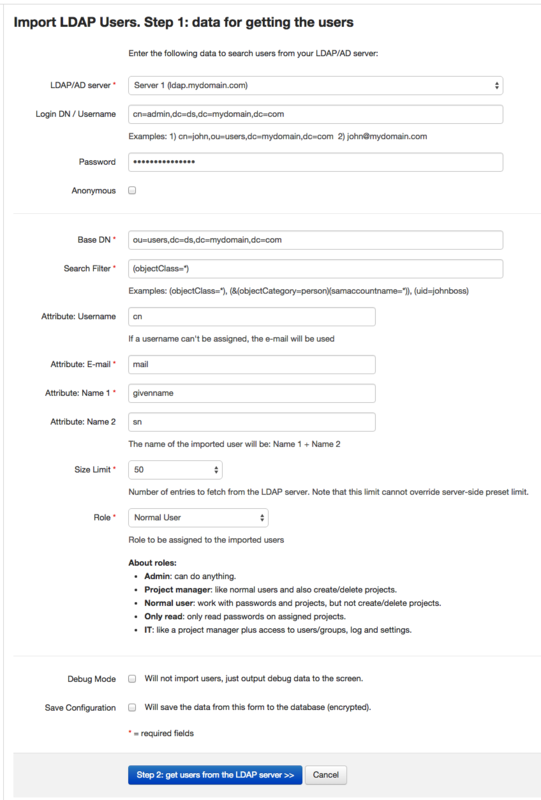 This section explains how to create an LDAP user manually. We suggest you learn how to do it even if you're planning to create the users by importing them from your LDAP server. Click on the "Users / Groups" option in the top menu. Enter the required fields and save. The "Login DN" field is the Distinguished Name of the user in the LDAP server. You'll find it by looking it up using your LDAP client. For Active Directory it can also be the username, for example: mike@mycompany.com. Note that the "Login DN" won't be validated. You can enter anything you like here, but if it's not the correct DN or Username, the user won't be able to sign in into Team Password Manager (because the bind operation with the LDAP server will fail). Also, the e-mail address entered here need not match the e-mail address of the user in the LDAP server (if the user has any). This e-mail address is only required for Team Password Manager. 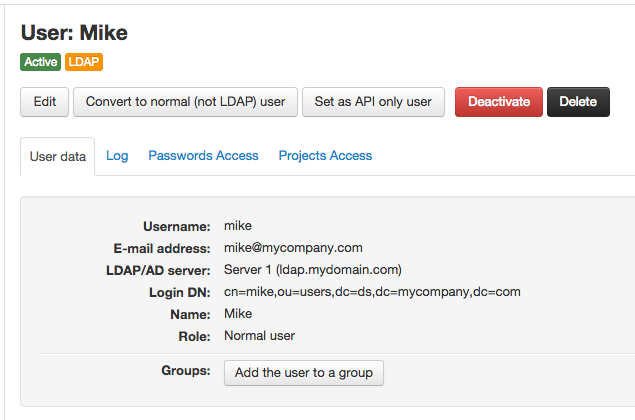 The "Login DN" field is the only "link" to the LDAP server for the user. Note that the "Login DN" field is stored encrypted in the user's record in the database. To test if you created the user correctly, have her sign in into Team Password Manager using her e-mail and her password from the LDAP server. As stated before, this newly created user has all the features of any other user in Team Password Manager. She can use two-factor authentication. She can be part of any group. She can be given access to any project. And so on. Creating many LDAP users manually can be tiresome and prone to errors. 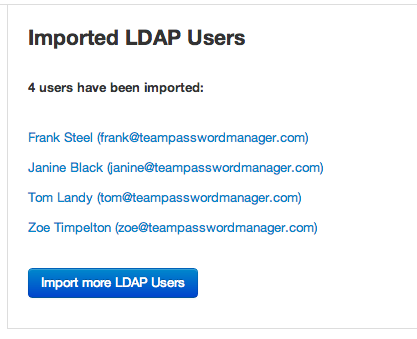 This is why Team Password Manager includes a function to import the existing users in your LDAP server. Importing users from your LDAP server will automatically create the user using the following data from the LDAP server: an e-mail, a name, the LDAP/AD server and a DN string. Of these, only the e-mail, LDAP/AD server and DN are required. 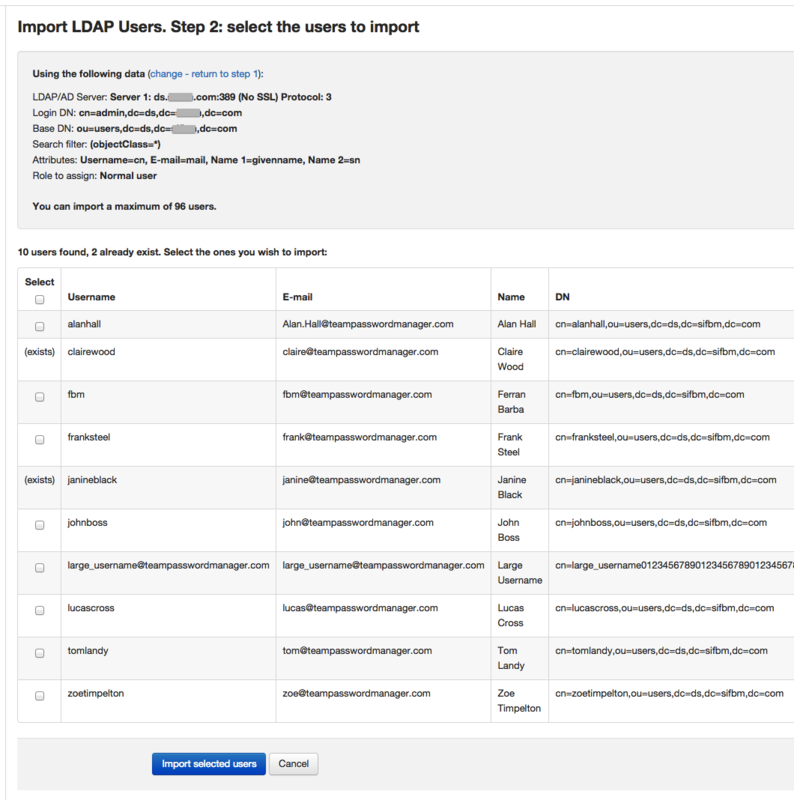 The import LDAP users feature is a two-step process that involves: 1) entering the required data to search for the users in your LDAP server, and 2) selecting the users you want to import. 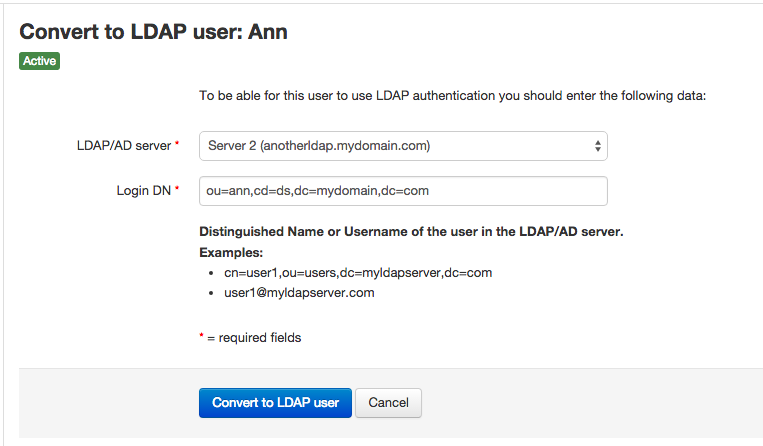 Enter the required fields and click on the "Step 2: get users from the LDAP Server >>" button. Below you'll find an explanation of these fields, but basically they fall into two groups: the credentials to connect to the server (like when testing) and the parameters to search for the users inside the LDAP server. This screen shows the users that Team Password Manager has fetched from the LDAP server, listed for you to select and import. If any of these already exist in Team Password Manager (username and/or e-mail matching) you won't be able to select them. So, select the ones you want to import, or all if you want and click on "Import selected users". You can repeat these steps as many times as you need to. 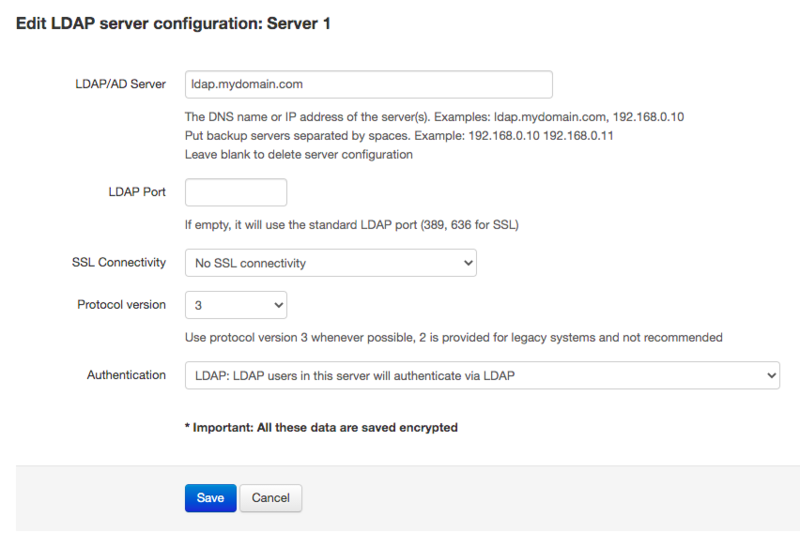 You can enter a different base DN each time so that you can fetch user from different branches of your LDAP tree, or you can use another server by selecting it from the list of servers you entered in the LDAP settings section. 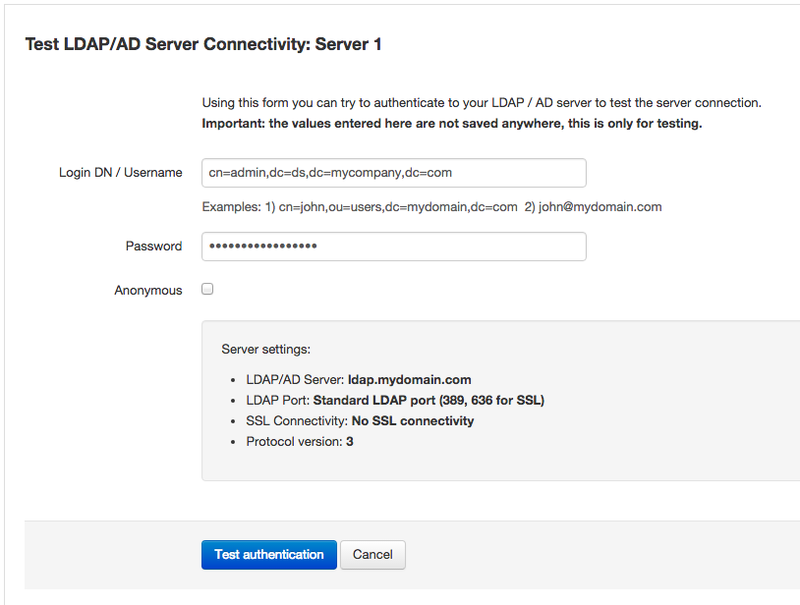 LDAP/AD Server, Login DN/Username, password and Anonymous: the same as in the testing screen. You can use any user that has the rights to search inside your LDAP server, in the Base DN you also enter. In the LDAP server from the screenshot, if I wanted to import the users from the ou=users branch, the Base DN would be: "ou=users,dc=ds,dc=mydomain,dc=com". Search filter: the filter you want to apply to search for users. The default is "(objectClass=*)", which will get you all the entries in the Base DN, but you might want to only get users for a specific group they belong to (example: "gid=502") or even only a specific user (example: "cn=johnboss"). Username, E-mail and name attributes: these are the attributes that your users have in your LDAP server for their username, email and name. The defaults given are the most common ones but you can change them. Note that: 1) if a user in your LDAP server doesn't have the e-mail attribute, she won't be imported, 2) if a user doesn't have any of the attributes for the name, the name of the imported user will be the local part of the email (ex: johnboss in johnboss@mycompany.com). You can later edit the user to change this name if you wish. Size limit: this is the maximum number of entries that will be fetched from the LDAP server. This limit also exists in your server and it rules over the one you're entering here. Role: the default role you want your imported users to have. If your Team Password Manager installation already has users that you want that they authenticate with your LDAP server, you should "convert" them to LDAP users instead of deleting them and importing them. You need to do this to preserve the user's permissions and history. Go to the user screen for the user you want to convert. Once you do this, the user will have to be validated against the LDAP server. Some notes: 1) the password the user had is not preserved, which means that if you convert her back to "normal", she won't be able to use it. 2) the user will not be kicked out of Team Password Manager. 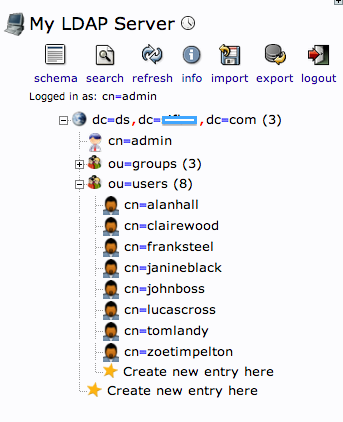 Important: we suggest that at least one admin user is a "normal" (not LDAP) user. If for some reason you have problems with your LDAP server or its connection, at least your "normal" admin user will be able to sign in into Team Password Manager. Click on the "Convert to normal (not LDAP) user" button below her name and accept the confirmation question. From now on, the user will have to authenticate using Team Password Manager's credentials. Note that if the user was previously a "normal" user, she will *not* be able to user the same password as before, and you should set/change her password or she should use the "Forgot your password" feature when signing in again. In this case you have two servers: ds.mymainserver.com and ds.mybackupserver.com. ds.mymainserver.com is the first server, and all connections will try this one first. If the first one is not available then the connection will be tried with the second one, ds.mybackupserver.com. 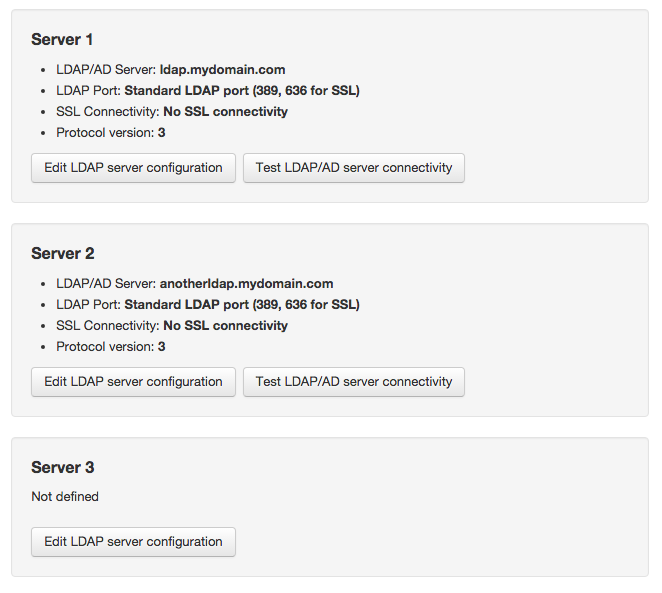 In this case, use ldap:// if you're not using SSL or if you're using TLS and use ldaps:// if you're using SSL (ldaps). In this case the delay is set to 2 seconds. Note that it cannot be set to 0. Normally the default timeout is quite large, so it's specially interesting to set it to a shorter value if you're using backup servers.